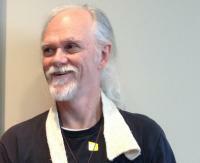 Dennis Formento lives in Slidell, Louisiana with his wife, artist and yoga teacher, Patricia Hart. Formento is the author of Spirit Vessels (FootHills Publishing, 2018), Cineplex (Paper Press, 2014,) Looking for An Out Place (FootHills Publishing, 2010) and a couple handsful of chapbooks and broadsides.Since 2011 he has been organizing local readings in New Orleans and in Covington, Louisiana for 100,000 Poets for Change, a world-wide movement for peace, ecological sustainability, justice and cultural exchange. Dude says, “somebody just shot me in the head! "Primo Levi's Poems," "a wall," and "White Dragon"